Over the last six years, I have had the privilege of traveling around Ontario raising awareness and support for our camp sponsorship program Stand in the Gap! The program was birthed in 2009 out of a discussion at one of our Board meetings and later fleshed out at a Saturday Board workshop I hosted and facilitated. The seed funding came from the estates of two lifelong supporters of “Camp Shalom”: Elizabeth Vanleeuwen and a good friend of mine John Logtenberg. Launched in 2010, Stand in the Gap has created a threefold focus to the ministry of “Camp Shalom”: Evangelism, Discipleship and a Missional Social Justice approach and has blessed 508 children, youth, and also a number of our guests with Special Needs. “When we journey alongside of the poor we see life different. Realize that what are small obstacles to some people are huge barriers to others. Summer Camp is a real privilege, but for some the cost represents and entire month’s income. With sponsorship there is the matter of transportation and competing priorities. Trust grows slowly. Stand in the Gap represents just one of many ways we offer hope to others, serving Christ by caring for kids and their families. Thanks for seeking to fill an important gap.” – Christ Community Church, Welland. Stand in the Gap is not just a camp sponsorship program that “enables” people to attend camp; it is a process that sees poverty as the result of relationships that do not work, that are not just, that are not for life, that are not harmonious or enjoyable. “Poverty is the absence of shalom in all its meaning. Poverty exists where one or more of the four foundational relationships for each person are broken: a relationship with God, with self, with others, and with the rest of creation.” Authors Brian Fikkert and Steve Corbett, from When Helping Hurts. 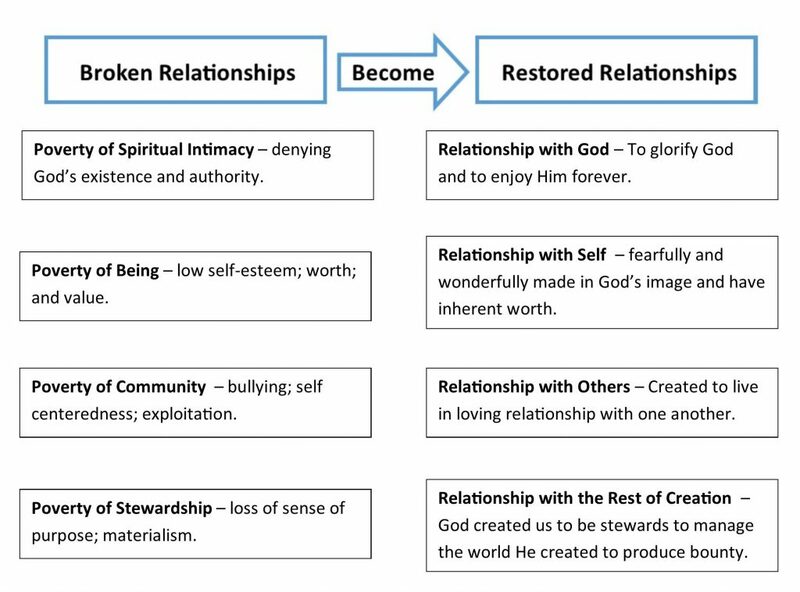 Three different approaches to poverty alleviation exist: relief; the urgent provision; rehabilitation; the restoration to positive elements; and development; the process of ongoing change that moves all people involved closer to being in a right relationship with God, self, others, and creation. Jesus stated in scripture, Mark 14:7 “For you will always have the poor with you, and whenever you want, you can do good for them.” Our goal moving forward with SITG is to define “good” as the process of ongoing change that moves a little boy or girl, a teen, or an individual with ‘special needs’ closer to being in a right relationship with God, self, others, and creation. Approximately 5 summers ago, I was looking for a Christian based camp that was a place my children can go to and have a great time, create new friendships and learning and growing with their relationship with Christ. I came across this Camp through the internet and I believe it was through the intervention of Christ that I was drawn to Camp Shalom. Since that first week of Camp five years ago, my 5 children have continued to attend the camp for a week in the summer. While not all five attend every year, I know they have all benefited from the camp. Every time I drop them off, they all have smiles and excited in attending. Being a single mom of 5 beautiful children and having hurt my back 4 years ago, I am just not able to afford the cost of the camp. It is the help of generous donors that have given an opportunity for my children to attend a camp that is not Christian by just name. When I pick them up at the end of the week, I hear about all they learned and while they talk about the new friendships that were made, seeing familiar faces, reconnecting with “camp” friends, what treats they got to eat, or how cold the pool was, I ALWAYS hear about what they learned regarding Christian based teachings. They talk about how they feel safe to express their faith and not worry about being picked on or made fun off. They come back with a deeper sense of who Christ is…through scripture and through their heart. They find strength to not be afraid of who they are and not worry about what others might think because of their faith. I appreciate all the support that I continue to receive from people that I don’t even know and I also know they continue to pray for them throughout the year. Here’s how it works. The camp partners with 12-15 churches, agencies and service organizations that have the capacity to identify and follow-up with marginalized children and youth and individuals that may have special needs within their church community. Once the organizations identify the individuals, they contact me at the office and I assign to them a certain number of requested spaces in the SITG Program. Each year the camp allocates 90 spaces within our programs for Stand in the Gap participants. These organizations pay the first $135 to sponsor each qualified camper which assists in off-setting the actual session costs. The difference is raisied through sponsored events, like our upcoming Spring Choir Concert at Drayton Reformed Church May 6th, and our new monthly Stand in the Gap Camper Sponsorship Program. Are you ready to Stand in the Gap for one of these 90 individuals? Here are some practical ways you can help today. Pray – for 15-20 sponsoring organizations to be eager, willing and able to participate annually in the Stand in the Gap program. Pray – for the staff of the 15-20 sponsoring organizations that they will be able to identify children, youth, and possibly individuals with special needs from their community that would benefit from this program. Pray – for the individuals identified, that the staff of “Camp Shalom” will be able to feed into their lives spiritually and that their relationships with God, Self, Others and His Creation will begin restoration. Pray – for the sponsoring organizations and their follow-up measures to bring the entire family of the campers selected into fellowship at their church and restored relationships. Pray – for individuals, families, small groups, and businesses to discerns God’s will and become Stand in the Gap sponsors; ether with a monthly pledge of $35, an annual pledge of $420, or any partial pledge amount to assist in covering the $38,000 annual need. For more information, you may contact the camp office at 1-800-226-7722 or go to countrysidecamp.com.